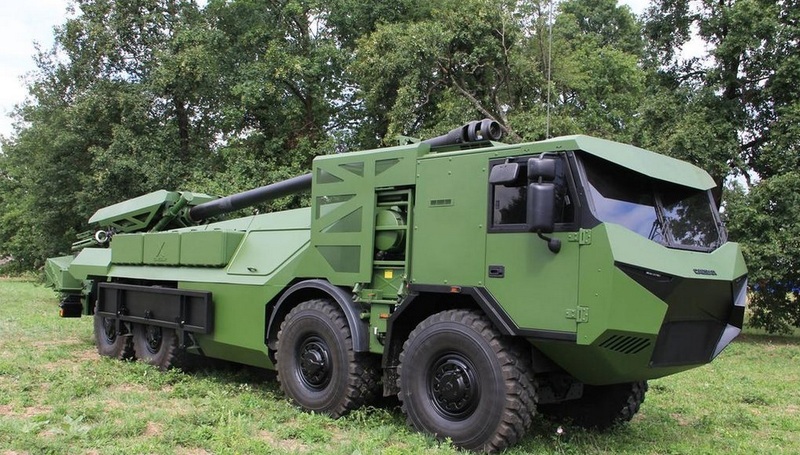 LONDON, -- French company Nexter has responded to this trend for platform growth with the introduction of a new and heavier variant of its Caesar self-propelled gun at this year's DSEI exhibition. Nexter has swapped out the traditional 6x6 chassis, which was capable of being loaded on a C-130 Hercules, with a heavier 8x8 platform. The 155mm/52 cal. gun has remained the same as the original 6x6. 'The problem [with the 6x6 variant] is that if you want more ammunition, more crew or more protection, then you are limited by volume and mass,' said Didier Rampal, Nexter's sales manager for the Caesar system. At this year's DSEI, the new 8x8 on display featured a chassis manufactured by Czech company Tatra. Rampal told Shephard that a Rheinmetall MAN and Renault chassis could be used as well. 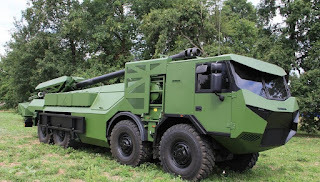 Nexter are also in talks with Iveco to offer a chassis for the system. The 8x8 weighs around 30 tons, dependent on configuration, while the 6x6 vehicle weighs in at less than 18 tons. The new variant is not capable of being loaded onto a C-130, but Nexter admits there are some customers who do not require it. Rampal added that the new 8x8 was air transportable on the A400M, currently being introduced by several European nations. The new Caesar comes with Level 2 protection as standard and with additional armour can achieve Level 3 standards. It is capable of 90km/h and a range of 600km on the road, while off-road it can achieve more than 50km/h. As it shares the same gun, the firing characteristics are almost identical. Caesar can fire six rounds a minute and has a range of 42km, which can be extended to 55km with rocket assisted projectiles. Thanks to its increased weight the 8x8 variant will be able to carry 30 rounds of ammunition, compared with 18 rounds for the 6x6. The gun is compatible with all 39/52 cal. NATO standard and Extended Range, Full Bore (ERFB) ammunition as well as smart ammunition such as BONUS. Rampal explained to Shephard that the platform’s capability will be increased further with the development of an auto-loading system. The Nexter official would not comment on any specific countries it is talking to about the 8x8 system, though it was mentioned that countries with specific mobility requirements are unlikely to be interested in such a heavy platform. ‘It’s really about the concept of operations for the individual armies,’ Rampal explained. The 6x6 variant is in service with the French Army, among others, and has deployed to several theatres including Afghanistan, Lebanon and Mali. Deliveries are also underway with Indonesia and a possible contract with India is also being pursued. The CAESAR 155mm SPH on the Tatra T815 (8x8) cross-country chassis.